Wednesday: Sun and puffy clouds, chance sprinkle. Highs in the 60s. Overnight Wednesday: Variable clouds. Lows around 50. Thursday: Pleasant and fair. Highs in the 70s. It remains jacket weather outside this morning, and many of us have the heat going inside, with low temperatures starting in the 40s north and low 50s south. There are also leftover areas of dense fog and patchy drizzle. Weak high pressure is moving in for a mostly rain-free Wednesday, but there's enough moisture and instability for a few sprinkles. High temperatures will reach the 50s to near 60 north, and at the coast, to near 70 degrees inland and west. We should have fair sky without too much fog overnight with low temperatures in the 40s and 50s once again. The next cold front from Canada pushes into northern New England tomorrow afternoon with a chance of a shower or thunderstorm. It looks a little warmer with the high temperature in the 70s as we have more of a breeze from the southwest. Another cool but dry start on Friday, but with plenty of sunshine and we should make it close to 80 degrees. The weekend forecast remains a bit challenging, low pressure will be passing south of Long Island, and we may have a period of rain from Connecticut to Cape Cod late Saturday and Saturday night. 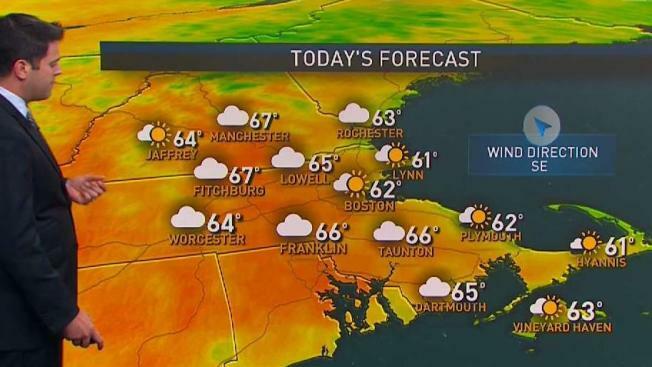 But it looks dry for the Boston Pride parade with high temperatures in the 70s. Sunday may start off with some clouds and showers south, otherwise sun and clouds with a high temperature in the 70s.